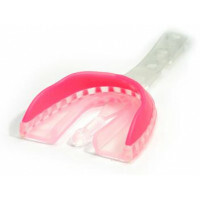 Our 35-second, custom fit Mouth Guard features two separate materials. The upper part of the Mouth Guard that touches the braces will not change shape after boiling, therefore it will not get caught under the braces' wire. 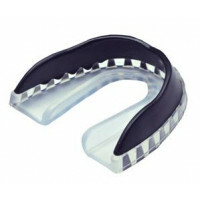 The lower part of the Mouth Guard is custom fitted to the bottom of the teeth after boiling. 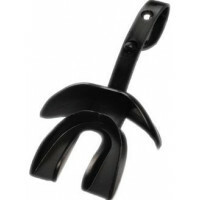 Provides outstanding protection against tooth injury, jaw injury, and mouth contusions. Includes a $15,000 dental injury warranty. 35-second custom fit for all sports. Color: pink, purple, or black. All one color. 35-second custom fit with one-piece quick release strap. Worn by the pros. 35-second custom fit with added lip protection and a one-piece quick release strap.